From lovers of the Neo-Victorian and Edwardian era—the latter the reign of Britain’s King Edward VII, to lovers of All-Things-Edward Gorey—that is, the author, illustrator, and designer, Edward St. John Gorey of the Gashleycrumb Tinies and “PBS Mystery!” intro fame. The Edwards deliciously collide as hundreds of creative, elegant, and envelope-pushing costume-wearing revelers will flock to The Edwardian Ball this weekend, held once again at The Fonda Theatre concert hall, Saturday, February 9, 2019. Now in its 10th year in Los Angeles, the Edwardian Ball returns to The Fonda Theatre with “The Rose Pedal Garden,” featuring a “playful, bicycle-powered wonderland blended set in an enchanted English garden,” based on Edward Gorey’s cranked-up classic illustrated book, “Epiplectic Bicycle.” The Fonda, formerly known as the Music Box, a Spanish Colonial Revival-style venue opened in 1926 by movie star giants and movers and shakers John Barrymore, John Gilbert, Reginald Denny, King Vidor, and Mae Murray, holds a special place in the hearts of the Ball’s founding team. The “multi-night, multi-city, multimedia extravaganza” has become an internationally recognized festival of the arts which presents this “Edwardian world” blend with the blessing of The Edward Gorey Charitable Trust. For the past 19 years, The Edwardian Ball organizers and team have selected a Gorey illustration as a theme for the Ball. Along with Rosin Coven, the orchestra for the Ball, and Vau de Vire Society , the dance/circus performance group lead and directed by Co-founder Mike Gaines, they take and “illustrate” their own story each year, presenting an interpretation through a stage show, original music, costumes and other performances—sometimes with an added backstory. Aside from Gorey’s illustrations, he was also a prize-winning set and costume designer for theater productions on the east coast and on Broadway. His illustrations graced publications like The New Yorker and The New York Times, and books by authors such as Dickens, Lear, Beckett, Updike, Woolf, H.G. Wells, and Heide. For the costuming of the Vau de Vire troupe, Gaines said that they are often inspired directly by Gorey’s illustrations themselves. For the costume ideas and designs in general, Gaines credits his wife, Shannon Gaines, also the show’s Choreographer. Then the performers themselves “dig in,” he said, and work on their own costuming with some guidance from wardrobe. Rosin Coven works directly with the same costume designer every year, Bay Area Designer Rose Hardin. Taking from a character from the Vau de Vire story, they will then create one character first. Then they create the ensemble character set based on that one. According to Katz, his band Rosin Coven is the musical performance group that originally founded the Edwardian Ball in 2000. But after four years of “performing, reading, acting, singing, dancing, tap dancing—all at the same time!—we enlisted wisely with Vau de Vire, our creative partners, to perform these great stage shows. And from 2005 onward it’s been an annual creative collaboration,” said Katz. 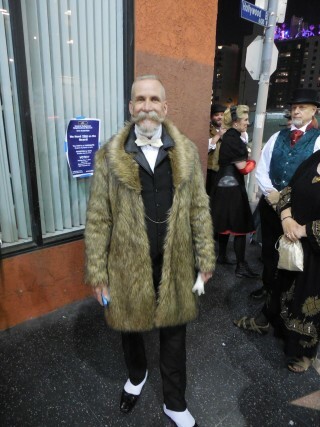 He sees The Edwardian Ball as “a very carefully curated multimedia, multi-modal, art festival” and that he, Gaines, and the Team “hold to a very elegant and high standard” but that the real star of the event is the participants who attend. 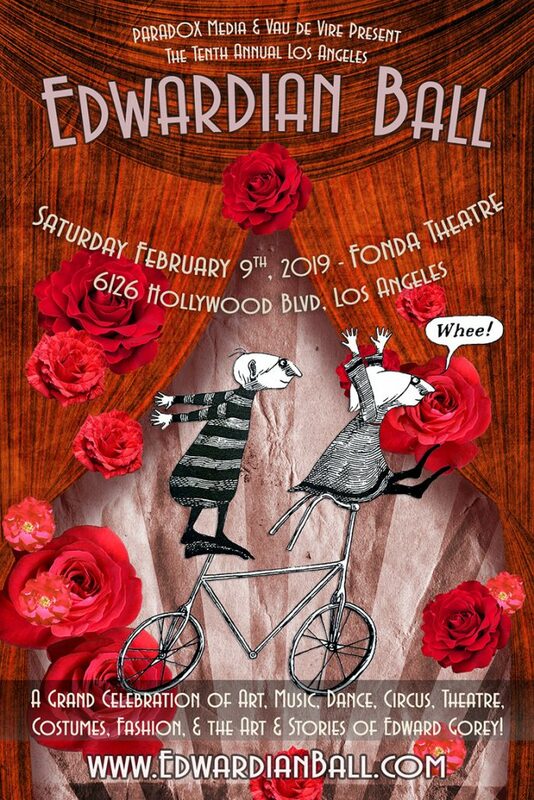 The 10th Annual Edwardian Ball will take place at The Fonda located at 6126 Hollywood Boulevard Los Angeles, California 90028, Saturday, February 9, 2019. Doors open at 8:00 p.m. and the Ball ends at 2:00 a.m. Tickets are $60 – $100 + VIP Booth Packages. VIP Balcony includes access to Seated VIP Balcony with best view of stage performances and main floor, cocktail service, plus all performances, art & installations, rooftop garden, gaming, tarot, portrait booth, Absinthe Bar, and you can skip the line at the VIP entrance. Very limited, front-row, VIP reserved booths for 4 and 6 people available while they last. For The Edwardian Ball VIP Experience, get thy tickets here. This entry was posted in Art, Attractions, Events, Fashion, Miscellanious, Theater, Upcoming Events and tagged 10th Annual Edwardian Ball, cos-play, costumes, Edward Gorey, Edwardian, Justin Katz, Mike Gaines, Rosin Coven, Shannon Gaines, The Edward Gorey Charitable Trust, The Edwardian Ball, The Fonda Theatre, Vau de Vire. Bookmark the permalink.